Constant innovation and unwavering commitment to the business have helped the world’s leading investment banks better serve their clients and build their market share. The investment banking industry continues to evolve as a result of the financial crisis and attempts to ensure that the worst financial meltdown since the Great Depression does not recur. New regulations are still being written in various jurisdictions around the world. In Britain, for example, the government is considering whether to force banks to separate their retail and investment-banking arms, although nothing is likely to happen until after the Independent Commission on Banking presents its recommendations in September. 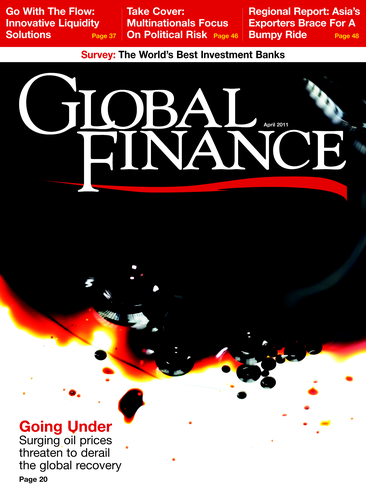 In Europe the sovereign-debt crisis caused many companies to avoid financings and takeovers last year. 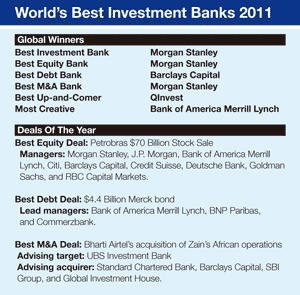 Freeman Consulting estimates that investment banking fees in Europe declined by 10% in 2010 to the lowest in six years. In the Americas, by contrast, fees from mergers and acquisitions jumped by 52%, and income from record high-yield debt deals rose 76% from 2009. The financial crisis began with the bursting of the US housing bubble and the implosion of the shadow banking system. Nonetheless, it is the Wall Street banks that have rebounded most quickly and that have taken the lead in developing new business models that rely less on proprietary trading and more on asset management, securities underwriting and advice on mergers and acquisitions. The best investment banks put their clients’ interests first, help companies and government entities raise capital more efficiently and provide valuable advice on financial restructuring and takeovers. 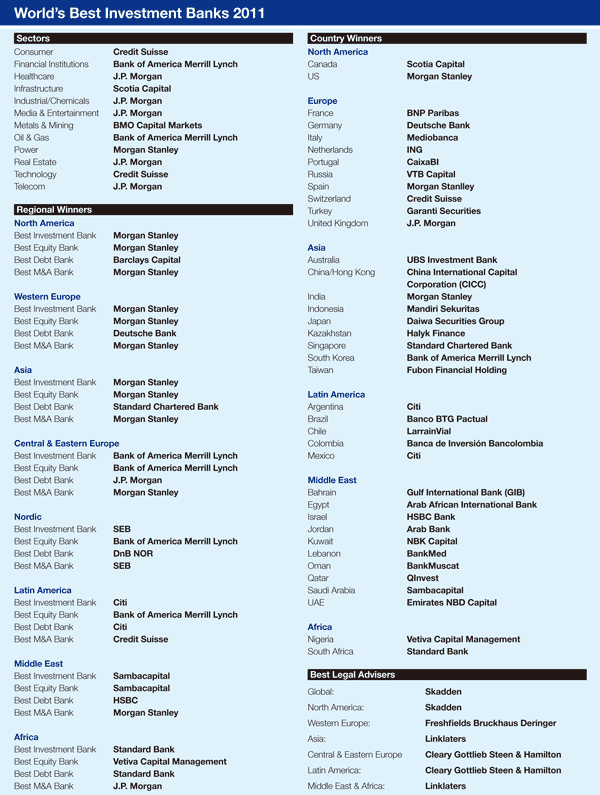 Global Finance editors, with input from industry analysts, used a series of objective and subjective criteria to identify the best investment banks in a wide range of categories, by both geography and sector.